Op welke manieren kan jij je taalcursus bij Babel financieren? If you live in the Netherlands and you want to become a naturalised citizen, then you can study Dutch at Babel to prepare yourself for the naturalisation exam or the State Exam of Dutch as a Second Language. Babel gears its courses towards people with a higher educational background: the pace of learning is quite high, and students need to be able to speak English, which is the support language (at least at the start of the course). Babel holds the quality standard label ‘Blik op Werk’, meaning that you may be able to pay your course fees with a loan from the Education Administration Service (Dienst Uitvoering Onderwijs or DUO). You do not receive any funds into your bank account. Instead, DUO will pay the invoices for your course and exam. In this way, you take out a loan from DUO, which you will have to pay back to DUO later with interest*. For more information, see the DUO website. Please note: you may use your DUO loan to pay for Dutch courses only until you have taken the naturalisation exam or the State exam in Dutch as a second language. So after taking the exam it is no longer possible! * If you are a refugee or (successful) asylum seeker (for example via the UAF) and you complete your naturalisation within 3 years, then you do not need to pay back your loan. For more information, see this website. Apply for a loan from DUO. Within a few weeks you will receive a letter confirming the loan and stating the maximum amount that you can borrow. As soon as you have received a letter from DUO granting you a loan (example), go online to book a date for an intake interview* with a teacher from Babel. During this intake interview, the teacher will explain how Babel works and you can decide together whether Babel is the right school for you. If you wish to register for an Intermediate (B1) course or higher, you will need to complete a placement test online before the intake interview. The intake interview takes place at Babel and lasts for approximately 20 minutes. If the outcome of the interview is that you will take a course at Babel, you and the teacher can choose which of our range of courses you will follow. Directly after the intake interview, you can book a course online using a computer at Babel. Please then, while you are still at Babel, sign the course contract and the invoice for DUO. Now your booking is confirmed, and DUO will pay Babel directly for your course. * From 15 February 2017, all new students at Babel must come for an intake interview before they can register. I have already done a course at Babel, what then? a. Use the online form to register for the follow-up course you wish to take. Please note: you can only register for a follow-up course if you have successfully completed a previous course (this will be checked by our administration staff). b. When you register, choose ‘DUO-lening’ (DUO loan). c. When you register, choose the option that Babel will order the course books for you (these will also be paid for by DUO). You will be sent a course contract straight away by email. 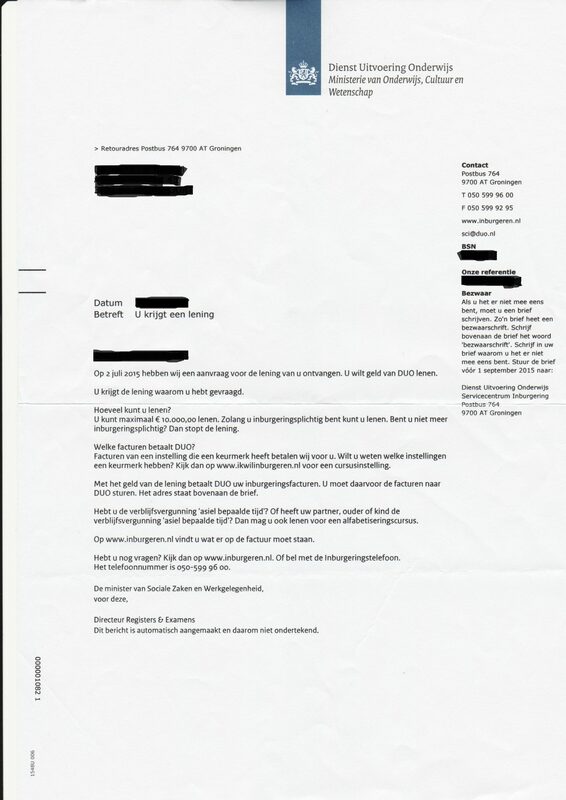 Read the contract carefully, sign it and send it back to contract@babel.nl within one working week. Your registration is only successful once we have received your course contract within one working week. If we do not receive it on time, your registration will be cancelled. You will receive an email confirming your registration within one working week. You will receive the invoice by post. Your booking is now confirmed, and DUO will pay Babel directly for your course. Best wishes for a successful learning experience!